This type of radiation emanates from the patient and from the X-ray source. Despite best practices, there is always the chance that the operator might insert parts of their anatomies into the primary beam. Historically, clinicians have used heavy, fatigue-inducing lead or “light-lead” aprons, which pose risks to clinicians in the form of spine injuries and debilitating back pain from their extended use. A means to effectively cut radiation to unprotected hands without reducing tactile feel would be an important advance in radiation safety for the clinician. The K absorption edge of lead (69 keV) is higher than the energy of much of the scatter radiation energy present in medical imaging. The first layer of barium sulfate in XPF garments, with K edge of ~ 37 keV, has a higher mass attenuation coefficient than lead and thus can effectively reduce dose at lighter weight. In reducing dose, barium sulfate itself generates fluorescent energy peaks at ~ 37 keV. These sub-40 keV peaks are known to be biologically more harmful. The second layer of bismuth oxide removes these fluorescence peaks. This barium sulfate upstream/bismuth oxide downstream bi-layer configuration is particularly effective in eliminating the more harmful sub-40 keV radiation spectrum, rendering XPF® Technology safer than other lead-free alternatives. Studies show that XPF offers the highest attenuation per unit weight, enabling lighter, more comfortable protective garments. 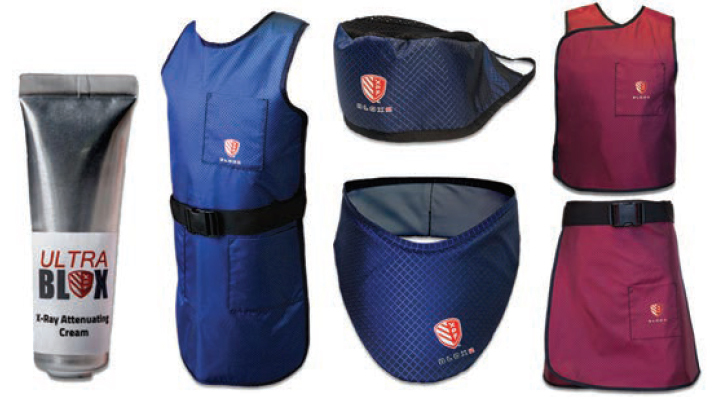 XPF Radiation Protection Apparel is optimized to be safer, more comfortable and greener than traditional toxic, heavy metal-based radiation shielding. ULTRABLOX® Cream utilizes bismuth oxide as a radiocontrast agent to provide attenuation protection from harmful scatter radiation exposure in the diagnostic imaging range of up to 130 kVp. The cream is sterile and biocompatible. It contains no lead, lead by-products or other toxic metals. 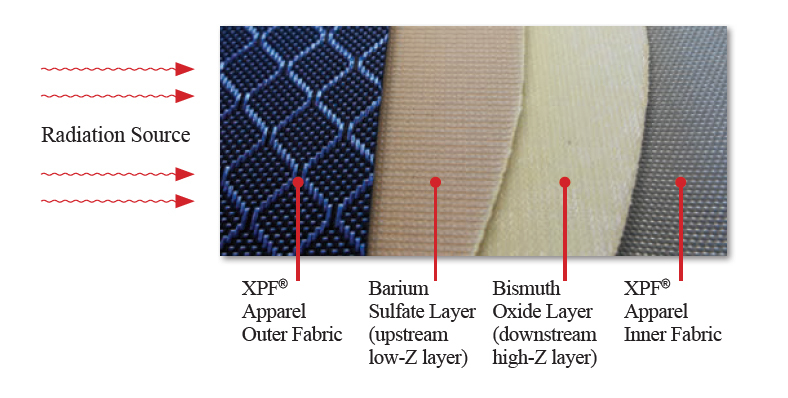 In addition, XPF Radiation Protective Apparel is cleared by the FDA as 0.5mm Pb lead equivalent product (K110900). Clinicians can protect their hands without loss of tactile feel or dexterity. The ULTRABLOX X-Ray Attenuating Cream is cleared by the FDA (K123422, K133684). BLOXR® can be your new radiology supply leader. Contact Legacy Scientific today to learn how we can help service your professional medical supply needs. REFERENCES: 1 Brenner, D. J. et al. “Computed Tomography – An Increasing Source of Radiation Exposure.” New England Jrnl of Med. Nov. 27, 2007. 357; 22, pp2277-2284. 2 “U.S. Markets for Computer-Aided Diagnostic Imaging Products.” MedTech Insight. Dec. 2009 3 Redberg, R. “Cancer Risks and Radiation Exposure from Computed Tomographic Scans.” Arch Intern Med. Vol 169 (No. 22), 2049, Dec 14/28, 2009. 4 Roguin, A., et al. “Brain and Neck Tumors Among Physicians Performing Interventional Procedures.” Amer. Jrnl of Cardiology.2013. 5 Balter, S. “Radiation Safety in the Cardiac Catheterization Laboratory: Operational Radiation Safety.” CCVI. 47:347–353 (1999). 6 Schueler, B. et al. 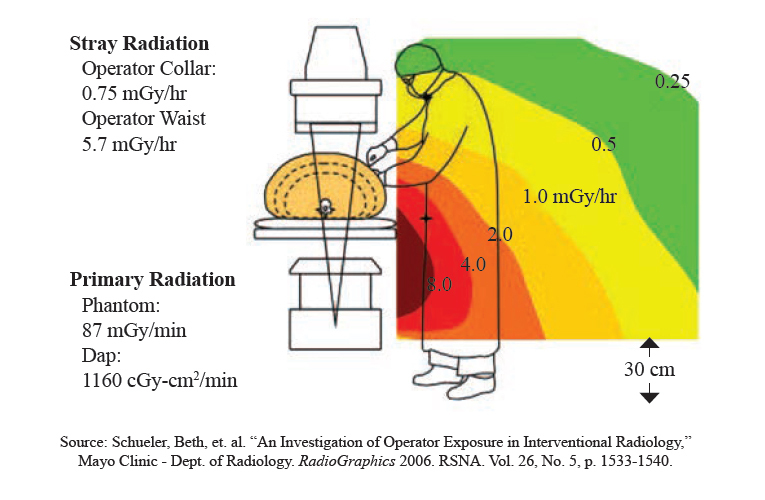 “An Investigation of Operator Exposure in Interventional Radiology”. Mayo Clinic – Dept of Radiology. RadioGraphics 2006. RSNA. Vol. 26, No. 5, p. 1533-1540. 7 Goldstein, J.A. et al. “Occupational Hazards of Intervntnl Cardiologists: Prevalence of Orthopedic Health Problems in Contemporary Practice.” CCVI. 63:407–411 (2004). 8 Balter, S. “Radiation Safety in the Cardiac Catheterization Laboratory: Operational Radiation Safety.” CCVI. 47:347–353 (1999). 9 Whitby, M. et al. “Study of the Distribution of Dose Across the Hands of Interventional Radiologists and Cardiologists.” The British Jrnl of Radiology. Health Physics, Dept. of Clinical Physics and Bio-eng., Gartnaval Royal Hosp., Glasgow, UK. 2005 pgs. 219 – 229. 10 Uthoff, H. et al. ”Lightweight Bilayer Barium Sulfate–Bismuth Oxide Composite Thyroid Collars for Superior Radiation Protection in Fluoroscopy-guided Interventions: A Prospective Randomized Controlled Trial.” Radiology, doi: 10.1148/radiol.13122834, Oct. 2013. 11 McCaffrey, F. et al. “Radiation Shielding Materials and Radiation Scatter for IR Physicians.” Med. Phys. 39 (7), 4537, July 2012. 12 Internal testing 13 Uthoff, H. et al. Op. cit. 14 Mayekar, E et al. ”Radiation Exposure To The Orthopaedic Surgeon and Efficacy of a Novel Radiation Attenuation Product.” Southern Orthopaedic Soc. June, 2014. 15 Reeves, R. et al. “Brain Radiation Exposure and Attenuation During Invasive Cardiology Procedures.” SCAI Annual Mtg, May 2014. 16 Weisz, G. et al. ”X-ray Radiation Protection With a Disposable XPF Cervical Collar – Comparison To a Lead-Based Collar.” ICI Mtg, Tel Aviv, Dec. 2013. 17 Shah, S. et al. “Radiation Protection to Surgeons Hands with a Novel Radiation Attenuating Lotion” Amer. Acad. of Orthopaedic Surgeons. Scientific exhibit abstract 12 SE- 2596- AAOS. May, 2011. 18 Dougherty, E. et al. “Fluoroscopic Radiation to the Orthopedic Traumatologist’s Hand & Efficacy of a Novel Radiation Attenuation Product.” AAOS Annual Mtng, Chicago, Mar. 2013. 19 “U.S. Surgical Procedure Volumes.” MedTech Insight. Mar. 2009.